This Research-Related Conference Support for Planning of Individual Participant-Level Data Meta-Analysis (RRCS-IPD MA) document includes guidelines for available funding support for meetings that align with the Patient-Centered Outcomes Research Institute’s (PCORI’s) mission and strategic plan and facilitate the initial convening and collaboration of investigators with relevant trial data from multiple studies to evaluate the feasibility of and develop plans with the ultimate aim of conducting a high-quality, rigorous individual participant-level data meta-analysis (IPD MA) in a clinical area of demonstrated need and value. Any private-sector research organization, including any nonprofit or for-profit organization; any public-sector research organization, including any university or college hospital or healthcare system; any laboratory or manufacturer; or any unit of local, state, or federal government may submit applications. The Internal Revenue Service must recognize all U.S. applicant organizations. Given the need for PCORI-funded research to result in findings that are relevant and useful in the United States, PCORI’s general preference is that prime awards should be with a U.S.-based institution. A non-U.S. based prime award contract should be carefully justified and preferably include a key U.S.-based subcontract co-PI. In all cases, applicants must ensure the importance and applicability of the results of the research to the U.S. population. Meta-analysis involves pooling quantitative evidence from related studies to estimate the effect of an intervention, along with a confidence interval. Traditionally, meta-analyses synthesize information at the overall study level. An alternative approach is the individual participant-level data meta-analysis (IPD MA), which uses the pre-specified variables for each individual participant from multiple applicable studies and synthesizes those data across all studies to assess the impact of a clinical intervention in a more granular fashion. IPD MA has several important potential advantages, including the ability to (1) standardize the analysis across studies; (2) include more up-to-date information than was available at the time of each original trial’s publication; (3) incorporate results for previously missing or poorly reported outcomes; and, most importantly for the Patient-Centered Outcomes Research Institute (PCORI), (4) help personalize clinical decisions by assessing differential treatment effects for specific subgroups. IPD MA can also allow for better ascertainment of the optimal dose, timing, and delivery method of a specific intervention that might have been previously tested in multiple, non-uniform ways. IPD MA is relevant to PCORI because it will advance one of our essential functions defined in our authorizing legislation, which is “to assist patients, clinicians, purchasers, and policy makers in making informed health decisions by advancing the quality and relevance of evidence...through research and evidence synthesis…” PCORI is interested in developing a portfolio of funded IPD MAs across clinical topics of clear need and importance to advance understanding of the clinical issue and the methods of this type of analysis. PCORI recognizes that effective planning for an IPD MA includes convening researchers from multiple studies to evaluate the importance and feasibility of an IPD MA and to develop collaborative plans for a robust IPD MA. Thus, we hope to provide funding for research-related conferences to support planning of individual participant-level data meta-analysis (RRCS-IPD MA) for investigators with relevant trial data to meet and build viable, working trialist collaboratives as necessary to engage in a high-quality and rigorous IPD MA that can inform decision making and patient choice in clinical areas of demonstrated need and value. The support is intended to facilitate the sometimes challenging process of identifying and bringing together all key players and establishing the needed commitments related to IPD MA proposal development and data sharing required to conduct a successful IPD MA. As a natural follow-on opportunity, PCORI plans to issue a PCORI Funding Announcement (PFA) to provide funding opportunities for the conduct, analysis, and reporting of an IPD MA that adheres to the PCORI Methodology Standards and our model for ensuring independent, trustworthy results. Although PCORI hopes that funding meritorious proposals for conferences to support planning for IPD MA will lead to strong applications for the conduct of an IPD MA, we do not guarantee that our funding of a conference award will result in the funding of an IPD MA proposal that arises from a PCORI-funded conference. PCORI anticipates that the later PFA for the conduct of an IPD MA will include the need for trialists to partner with independent methodologists to address PCORI’s requirement that IPD MA be conducted without conflicts of interest. We anticipate that the PFA will require applicants to successfully demonstrate two key accomplishments necessary for a successful IPD MA. These requirements are also important for the conference support awards. The two key accomplishments are (1) that an IPD MA is justified for a specific clinical topic to answer critical questions about comparative clinical effectiveness or treatment heterogeneity and (2) that the trialist consortium has demonstrably created an environment that will foster sufficient agreement and collaboration among investigators to make accessible a minimum threshold of the total IPD for that research question and ensure robust trialist participation in the conduct of a methodologically sound and independent IPD MA. We anticipate that the independent methodologists will be matched with successful applicants by their own initiative in their research proposal or, if needed, with assistance from PCORI. We also anticipate that the methodologists will have established expertise in the underlying methods and successful conduct of high-quality, rigorous, and objective IPD MAs. As currently envisioned, the methodologists for the proposed IPD MA will serve as the prime awardees and conduct the analyses on the clinical research question of interest. They must provide support for substantial input from the trialist collaboratives under a model intended to maximize input of clinical and specialty expertise while minimizing risk of bias. (See the Governance Principles for the Conduct of PCORI IPD MAs for more information.) This envisioned structure will be an integral mechanism for ensuring that all PCORI-funded IPD MAs meet relevant PCORI Methodology Standards and governance standards to advance best practices related to potential conflicts of interest for participants in the IPD MA collaborative. The purpose of this award is to provide support for the initial meeting and planning of investigators with relevant trial data from relevant studies in a clinical area of demonstrated need and value with the ultimate aim of producing a proposal for a high-quality and rigorous IPD MA. Under this PFA, potentially viable topics for an IPD MA are explored by bringing together groups of investigators with related trial data to discuss key clinical questions, the potential for research plans and related data-sharing arrangements, and the creation of a plan to support conducting such an analysis. Organized, face-to-face meetings are eligible, where multiple investigators assemble to exchange information and explore issues or knowledge areas as they relate to developing a viable IPD MA proposal around a specific, defined clinical topic area where this type of analysis can be demonstrated to be of value and satisfy a previously unmet research need. PCORI anticipates that there will need to be a series of ongoing meetings to establish the necessary conditions for a robust IPD MA, as outlined above, and offerors will be evaluated on the likely effectiveness of their proposed plan and its efficiency. The maximum award total costs must not exceed $50,000. The maximum project period is one year. To apply for funding, you must register on PCORI Online. Please refer to the Online Application System User Manual: Submit an Application for an RRCS-IPD MA for detailed guidance on how to complete and submit an application. Select “Not a Member” to register. Your first and last name, a “nickname” (e.g., your first name), an email address, and a password are required. The email entered will be your user name. Please email us at [email protected] with questions regarding the registration process. You may not reorganize sections within the templates. You must keep the main header questions of the templates within your submission. You may delete instructional text. All templates provided in the Applicant Resources section of this PFA must be completed and uploaded with your online submission. Header: Each page should include the name of the organization, the project title, and the full name of the Project Lead in the header’s left-hand corner. Margins: Use half-inch margins or greater. The header may fall within the top margin, but the body text should not begin closer than one-half-inch from the edge of the page. Font: Use Calibri size 11 for the main body of the text. Figures and captions may be size 8 font. Page Numbering: Number each page of the document consecutively. Document Format: All uploaded documents must be in PDF, Microsoft Word, or Microsoft Excel format. The Budget Summary must be uploaded in Excel format. The Project Work Plan must be uploaded in Word format. File Name: The system will automatically rename your file with the document type, project name, year, and original file name. The organization’s Administrative Official (AO) must review and approve the proposal. The AO and the Project Lead may not be the same person. Only the AO can review and approve the final application for official submission to PCORI. The AO acknowledges PCORI’s contractual mechanism as a contract and not a grant, and accepts the contract terms and conditions on behalf of the institution without alteration. The Project Lead may select the authorization checkbox to indicate authorization has been obtained from the AO. Note: Selecting the authorization checkbox does not forward the application to the AO for their review. If the AO would like direct access to the application, he or she must request access by emailing [email protected]. PCORI encourages applicants to review this entire section and to print and complete the Application Checklist (see below) to ensure they submit the application correctly and completely. Additional instructions for some questions are included above the relevant question on PCORI Online. *Items with an asterisk are NOT required. They are optional. There are four tabs for the application: (1) Details, (2) Project Personnel, (3) Attachments, and (4) Review and Submit, as described below. You must select “Save” at the top or bottom of the page to continue to the next tab. The Details tab includes the six main sections of the application: (1) Organization and Project Lead Information, (2) Project Summary, (3) Project Information, and (4) Collaboration and Partnerships. Provide information about your organization (e.g., address), the Project Lead, and the Project Lead’s experience. The Project Lead is the lead representative of the organization/institution for the project. He or she must be affiliated with the primary institution or organization applying for the award, and serves as PCORI’s lead point of contact. Project Leads can participate in other applications (from the same or other organizations) in a different role, such as co-lead or consultant. The AO must be affiliated with the primary institution or organization applying for the award, and he or she is responsible for matters related to the award and administration of the contract. The AO’s signature certifies that the organization/institution will be accountable for the appropriate use of funds awarded and for the performance of the PCORI-supported project or activities resulting from the contract. He or she cannot be the Project Lead. A description of the unique capabilities of the Project Lead and the organization to address the issues described in the project description and background. Background—Briefly state the clinical problem and question(s) that you would design the IPD MA to address. Proposed Solution—Briefly justify why the clinical problem and question(s) would best be addressed by the convening of a collaborative of trialists leading to the ultimate proposal to conduct an IPD MA. Include your meeting’s location (i.e., city, town, or district) and venue (e.g., stand-alone meeting or associated with an annual meeting of a professional society). Objectives—Briefly describe the aims of the meeting, including long-term objectives. Activities—Provide a concise description of activities that will occur during the meeting. Outcomes and Outputs (projected)—Specify the projected outcomes and state their significance. What tangible outputs will this meeting produce? (e.g., formation of a viable IPD MA collaborative of investigators with relevant clinical trial data). Project Collaborators: Provide a description of relevant trial investigators or others who have expressed support for a potential IPD MA exploratory meeting or who have agreed to collaborate on this project in any way. Provide details about the meeting you would use these funds to conduct. Provide the name of organizational collaborators or partners, and describe the role the organization will play in meeting the project’s goals and objectives. Collaborator/partner organizations are project contributors that are not subcontractors (i.e., have no direct fiscal relationship to the applying organization that is established in exchange for work or services rendered). 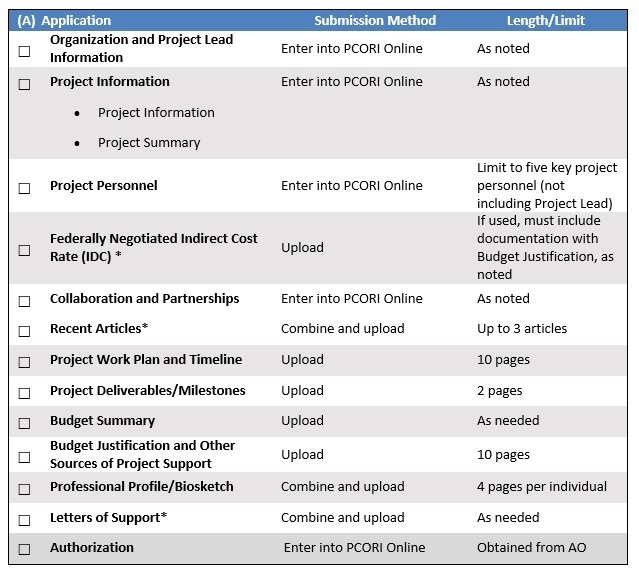 Select “New” to create a new project personnel entry in PCORI Online. Limit your application to the five most critical personnel, not including the Project Lead. When you have finished entering your project personnel, select “Continue” to be taken to the next tab of the application. Upload required documents by selecting “Select File” and following the prompts. Note that the system will rename your file using the document type, year, and original document name. Required templates are posted in the Applicant Resources section. When you have finished uploading all required documents, select “Continue” to proceed. Required attachments are described below. Upload the required template in Microsoft Word format. Describe the project in detail and the project’s strategy or approach. Include the following sections, considering that the goal is to support projects that will facilitate the collaboration of investigators with relevant trial data, with the ultimate aim of producing a proposal for a high-quality and rigorous IPD MA in a clinical topic area of demonstrated need and value. Background—State the clinical problem or question the meeting is designed to address. Proposed Meeting —Detail what the meeting is set to explore or evaluate. Describe how the meeting outcome is to be achieved (designed and implemented) or is at least achievable. Objectives— Describe the aims of the meeting, including how it will support the long-term objective of creating a successful proposal for a high-quality and rigorous IPD MA that will improve decision making and patient choice in a clinical topic area of demonstrated need and value. Expected Project Outcomes and Impact— Specify the key projected outcomes and state their significance. Discuss the metrics you will use to measure these outcomes. If applicable, describe any similar projects you or your organization has conducted in the past, any past experience with PCORI, or any additional relevant experience. If applicable, describe the protection of human subjects involved in your project. PCORI follows the Federal Policy for the Protection of Human Subjects (45 CFR part 46), including the Common Rule. For more detailed information, see Section 5, titled “Human Subjects Research Policy” from the Supplemental Grant Application Instructions for All Competing Applications and Progress Reports, which was issued by the U.S. Department of Health and Human Services (Department of HHS). Refer to the Required Education of Key Personnel on the Protection of Human Subject Participants requirement as you complete this section. Signed subcontract agreements are not required at the time you submit your application to PCORI. Submitting an application to PCORI signifies that programmatic and administrative personnel from your organization and all proposed subcontract organizations that will be involved in the project are aware of your organization’s subcontract agreement policy, and that all involved organizations are prepared to establish the necessary interorganizational agreement(s) consistent with that policy. You must include budget information for all subcontracted organizations in the Budget Summary and Budget Justification. Provide a list of references cited in the Project Work Plan, timeline, and deliverables, if applicable. Each reference must include the names of all authors (in the same sequence in which they appear in the publication); the article title; and the journal or book title, volume number, page numbers, and year of publication. Include only bibliographic citations. Follow scholarly practices when providing citations for source materials used in preparing any section of the application. Citations that are publicly available in a free, online format may include URLs or PubMed ID numbers along with the full reference. The references should be limited to relevant and current literature. It is important to be concise; select only those literature references pertinent to the proposed project so that you do not exceed the 10-page limit. Websites should be referenced in the standard URL format (i.e., http://www.pcori.org) with the date the link was last accessed. Each project should yield two required deliverables—an interim report and a final report. At least 90 days post-meeting, PCORI requires the applicant to submit a two- to three-page meeting summary report, written in lay terms, for posting on the PCORI website. In addition, applicants must provide copies of proceedings or publications resulting from the meeting to PCORI for public dissemination and use. Optional: Space is provided to include a narrative summary of project deliverables. Upload the required template in Microsoft Excel format. Enter a Detailed Budget for the duration (i.e., up to one year) of your project. Include all costs for your organization in the applicant worksheets. If applicable, include all costs for each subcontracted organization in the subcontractor worksheets for each year of the project. See Appendix 2: Allowable and Unallowable Costs (where applicable) to understand acceptable and unacceptable uses of PCORI contract funds. Personnel Costs: These include the base salary for each scientific and technical staff member, employee patient or other stakeholder partner, or other personnel on your project that are or are not accounted for in Section B: Consultant Costs. Provide a clear distinction between individuals who are key personnel and those considered “other” personnel. PCORI may request salary verification during the contract activation process. Such compensation may include salaries and fringe benefits. See Appendix 2: Allowable and Unallowable Costs (where applicable) for more information. Salaries include wages earned by an employee, and fringe benefits may include insurance and retirement plans. Provide documentation to support the fringe benefits with the Budget Justification. Level of Effort: Personnel contributing to a PCORI-funded research project are expected to monitor their total percent effort across all of their active funding so it does not exceed 100 percent. Before submitting the application to PCORI, the AO must certify that individual personnel will not exceed 100 percent effort, if funded. You must report effort by the percentage of time over the course of the project year. If you are not requesting salary support, use $0 for the base salary. Applicants must list all personnel dedicating effort to the project on the personnel budget with their level of effort, even if they are not requesting salary support. List the base salary for each person in the Budget Justification and Detailed Budget. Describe the individual’s specific functions in the Budget Justification. Provide an explanation of how the role supports the project aims and note any overlap in job functions. Salary Cap: The PCORI base salary cap for personnel is $200,000 annualized per individual, per year, exclusive of fringe benefits. An individual who earns less than $200,000 must use his or her actual base salary to calculate personnel costs. An individual with a full-time employee base salary of more than $200,000 must use $200,000 as the base salary rate in determining the amount of salary and time to charge to the project. Fringe Benefits: These costs are calculated based on the institution’s own policy. In the Budget Justification upload, applicants must provide a verification of the fringe benefit rate policy for the prime organization. Consultant costs apply to those individuals who are not employees of the applicant organization or under a subcontract agreement as members of the contracted staff. You must include payments to nonemployee patient and stakeholder representatives in the budget as consultant costs. Provide the total cost of consultant(s), their names, expected number of hours, and hourly rate. Include the daily consultant fee, travel expenses, nature of the consulting effort, and why the proposed project requires consultants. Note any overlap in duties with personnel. Consultant costs must be reasonable and justified within the Budget Justification. Supplies must be directly allocable and allowable to the proposed project and not part of general or administrative use. Include the category of supplies needed and the cost for each. Indicate general categories such as mailings and printing. Provide detailed explanations for all costs exceeding $1,000 in the Budget Justification. For all supply costs, provide computations for the way that applicants arrived at the specific number. You may not use items purchased under PCORI-funded projects as incentives to recruit or retain graduate students or any other project personnel. Travel may include any domestic or international travel by project personnel or consultants directly related to, and necessary for, the project and within the limits explained below. PCORI uses the Federal Travel Regulations guidelines for per diem and other reimbursements. You must itemize travel costs per trip and describe them as for either scientific travel or programmatic travel, as outlined below. Scientific travel includes travel to present at conferences, symposiums, and similar events. Scientific travel is capped at $10,000 over the life of the project. This cap is inclusive of the prime and all subcontractor scientific travel costs. Programmatic travel includes travel needed to conduct the project (e.g., travel to an in-person meeting to discuss an IPD MA collaborative). 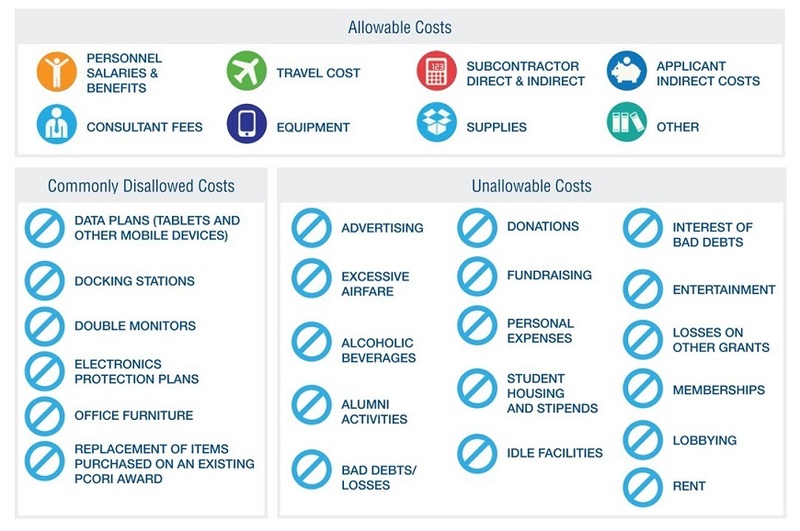 Although there is no cap on programmatic travel funds, PCORI closely reviews all travel costs for reasonableness. Airline or rail costs cannot exceed the customary standard commercial fare (coach or equivalent) or the lowest commercial discount fare. PCORI will not compensate upgrades. For each travel category (scientific and programmatic), provide the number of trips and a brief description of the trips, including the number of people traveling and dates or duration of the stays. In the Budget Justification, applicants must provide additional detail to explain the basis for the costs listed and describe how the travel is related to the proposed research project and necessary for achieving programmatic objectives. Indicate and include general categories such as printing, publication, illustration costs and non-consulting service contracts, when applicable. Use this section to include direct costs that cannot be accounted for in other budget categories. For example, these costs may include warranties, computer services, data warehousing, or participation incentives. In the space provided, include a detailed explanation for all costs exceeding $1,000. Applicants must provide further detail for each of these costs in the Budget Justification. When applicable, provide computations for how applicants arrived at the specific number. The subcontractor personnel’s effort on the project is calculated as part of his or her “professional time” for his or her employer organization. The subcontractor will be using significant resources (e.g., office space, supplies, computers, and personnel) at his or her own organization when working on the PCORI-funded project. State in the Budget Justification why you selected each subcontractor. Provide details on their specific role and the aim or deliverable they will be supporting on the project. Subcontractors must adhere to all PCORI budget guidelines, including allowable and unallowable costs. PCORI limits the total indirect costs to 40 percent (or 10 percent for foreign organizations and those without a federally negotiated rate) of personnel, consultant costs, travel, supplies, and other expenses and on the first $25,000 of each subcontract. Applicants who do not have a federally negotiated or independently audited indirect cost rate may assess up to 10 percent indirect costs, to be noted in the Budget Justification. Foreign applicants are eligible for no more than 10 percent indirect costs. The application must include a copy of the prime applicant’s Federally Negotiated or Independently Audited Indirect Cost Rate letter. Include these copies in a single file with the Budget Justification. In the event that an indirect cost rate agreement is more restrictive than that of PCORI’s accepted indirect cost application, we will allow the applicant to use the less-restrictive rule when calculating indirect costs on submitted budget categories. Although consortium indirect costs must be noted in the prime applicant’s direct-cost budget, consortium indirect costs are not included in the applicant’s direct-cost budget cap. *The 40 percent indirect-cost budget cap applies to U.S. applicants only. Foreign applicants are eligible for no more than 10 percent indirect costs. Upload the required template. Provide a justification that supports the costs proposed in the budget for the applicant organization and for each subcontracted organization (if applicable) for all years. Applicant Organization: Provide the detail needed to understand the basis for costs and the reason why the costs are necessary to the project for each budget category, providing adequate detail to understand any major cost variances. Subcontracted Organization Justification(s): Provide a detailed justification for each subcontract agreement by budget category. Specify any other sources of funding direct to the subcontractor in support of its portion of the project (see below). Upload the required template. If multiple profiles/biosketches are needed, combine them into one PDF or Microsoft Word document for uploading. Complete a Professional Profile/Biosketch section for the Project Lead and each person listed in the Key Personnel section (limit of five key personnel, not including the Project Lead). At a minimum, each profile must include the person’s name, title, and degrees; however, PCORI is especially interested to know each individual’s previous experience, past performance, and training in the field of patient-centered outcomes research (PCOR) (if applicable) and that team members are appropriately trained and suited to carry out the proposed project. Information from the National Institutes of Health (NIH) biographical sketches can be incorporated. If the Project Lead does not have PCOR experience, please outline appropriate collaborative arrangements with PCOR experts. Note: PCORI recognizes that not all sections of the Professional Profile/Biosketch may apply to patient or stakeholder members of the project team. Provide Letters of Support, including any letters necessary to demonstrate the support of subcontract participants and collaborators, such as stakeholder associations and other significant contributors included in the contract application. Letters of Support are not required for personnel (e.g., research assistants) who are not contributing in a substantive, measurable way to the project’s development or execution. Letters of Support must be addressed to the Project Lead, combined into one PDF or Microsoft Word document, and uploaded onto PCORI Online. You may include up to three relevant articles (published within the past five years), which help establish the clear rationale/need for an IPD MA in the clinical topic area proposed. Please combine them into one document and upload as a PDF or Microsoft Word file on PCORI Online. The Review and Submit tab allows you to review, print, and submit the completed application. Again, the organization’s AO must review the application and approve the submission. Select the authorization checkbox to indicate that you have obtained authorization from the AO. The AO and the Project Lead may not be the same person. Once your application is complete, and the AO has reviewed and approved it, select “Submit.” Required information will be indicated at the top of the application form in red. Once all required fields are completed and all required attachments are uploaded, select “Submit” to submit the application to PCORI. You may also print the application by selecting “Print.” You will not be able to edit the application once you have submitted it. Note: checking the checkbox does not forward the application to the AO for review, the AO must request access to the application by emailing [email protected]. This section includes language that is specific to PCORI’s requirements for funding applications. PCORI encourages potential applicants to review funded projects at http://www.pcori.org. We intend to balance our funded portfolio to achieve synergy and avoid redundancy where possible. Most of these standards are minimal. The PCORI Methodology Standards reflect practices that applicants should follow in all cases, and all deviations need to be explained and justified. Additional best practices—including accepted guidelines for conducting clinical trials or observational studies—should be addressed, if applicable, in the PCORI funding application. In 2015 the Methodology Committee undertook a process to review the existing PCORI Methodology Standards, updating and adding new standards where indicated. Although these proposed revised and new standards are still under review and have not yet benefited from public comment, we encourage you to refer to the potential revisions. Applicants should continue adhering to the current PCORI Methodology Standards. PCORI follows the Federal Policy for the Protection of Human Subjects (45 CFR part 46), including the Common Rule. For more detailed information, please see Section 5, titled “Human Subjects Research Policy” in the Supplemental Grant Application Instructions for All Competing Applications and Progress Reports, which is issued by the Department of HHS. PCORI does not require that applicants comply with sections of this policy referring to requirements for federal-wide assurance or that refer to standards for including women, minorities, and children. Awardees must also comply with appropriate state, local, and institutional regulations and guidelines pertaining to the use of human subjects in research. The Awardee Institution, whether domestic or foreign, bears ultimate responsibility for safeguarding the rights and welfare of human subjects in PCORI-supported activities. PCORI requires that all applicants adhere to the NIH policy on education in the protection of human subject participants in the conduct of research. This applies to all individuals listed as key personnel in the application. The policy and FAQs are available on the NIH website. PCORI contracts require all awardees to adhere strictly to publication policies that will be elaborated by PCORI during contract activation. The Department of HHS issued a final modification to the Standards for Privacy of Individually Identifiable Health Information, the “Privacy Rule,” on August 14, 2002. The Privacy Rule is a federal regulation under the Health Insurance Portability and Accountability Act (HIPAA) of 1996 that governs the protection of individually identifiable health information and is administered and enforced by the Department of HHS Office for Civil Rights. Decisions about applicability and implementation of the Privacy Rule reside with the Project Lead and his or her institution. The Office for Civil Rights provides information on the Privacy Rule, including a complete Regulation Text and a set of decision tools on “Am I a covered entity?” Information on the impact of the HIPAA Privacy Rule on NIH processes involving the review, funding, and progress monitoring of grants, cooperative agreements, and research contracts is available on the NIH website. The administrative and funding instrument used for funded projects are Cost-Reimbursement Price Agreements, not grants. As a funding organization, PCORI retains the right to administer programmatic and contractual oversight with awardees during the contract period. At any time during the contract, PCORI reserves the right to discontinue funding for awardees who fail to meet the mutually agreed-upon timelines and deliverables. Proposed deliverables should be presented in the application, but final deliverables will be negotiated in the post-award period before the beginning/activation of the funding period. PCORI partners with various other research organizations to leverage additional funds for some of its programs. If you currently have a funded project and would like to seek PCORI funding to add a new aim to the project that advances PCORI funding objectives, you may submit an application. PCORI will not fund a project already sponsored or funded through another organization. By submitting the application to PCORI, the AO is certifying that there is no overlap in funding at the time of submission. PCORI is committed to the publication and dissemination of all information and materials developed using PCORI funding, in accordance with its authorizing legislation. All recipients of PCORI contracts must agree to these principles and take steps to facilitate availability of data and samples. To select high-quality projects, PCORI staff and external subject matter experts (as necessary) will review all submissions. PCORI will evaluate all applications using the criteria described below. PCORI will analyze the budget and Budget Justification portions of the proposal to determine the feasibility of the proposed costs and associated justifications. PCORI evaluates proposals using the criteria listed above. Scores from each reviewer are collected and averaged. Reviewers are also asked to provide comments on the proposals’ strengths and weaknesses. PCORI aims to provide a final decision on the application, via email, within 40 days of receipt. PCORI may request additional information from the applicant after the initial review. In this case, it might take longer than 40 days to receive a decision. If the application is awarded, a PCORI staff member will coordinate arrangements to begin contracting negotiations. Applications should be submitted at least four months before the conference. Exceptions may be granted under special circumstances. Awardee organizations agree to provide PCORI opportunities to comment on the meeting agenda. You may acknowledge PCORI in all publicity, in the meeting program or agenda, and in any proceedings or publications resulting from the meeting. You should identify any specifics of this recognition in the application. You must also clearly identify sources and amounts of other funding for the meeting in the Budget Justification. Note: Detailed terms and other requirements will be provided to awardees to be agreed upon before the funding contract begins. Allowable Costs—A cost that is approved within the budget and is not otherwise disallowed under the PCORI RRCS-IPD MA Awards Policies described in this document. A direct cost is allowable to the project if the goods or services involved are chargeable or assignable to the project in accordance with relative benefits received or another equitable relationship. As a result, a cost is allowable to the funded project if (1) it is incurred solely to advance the work under the project; or (2) it benefits both the funded project and other work of the recipient organization, in proportions that can be approximated through use of reasonable methods. Biosketch—A profile of the experience and accomplishments of the key personnel in an application. Such a biosketch also satisfies the requirements of the Professional Profile/Biosketch described in the application requirements above. Closeout—The process by which PCORI determines that all applicable administrative actions and all required work of the contract have been completed, and officially closes the contract. Conflict of Interest—As defined by PCORI’s authorizing legislation, a conflict of interest is any “association, including a financial or personal association, that has the potential to bias or have the appearance of biasing an individual’s decisions in matters related to the Institute or the conduct of activities” [Patient Protection and Affordable Care Act, Pub L No. 111-148, 124 Stat 727, §6301(a)(3)]. Conflicts of interest will be considered and managed throughout every step of the review and selection process, including, but not limited to, the technical and programmatic reviews; the selection and assignment of scientific and stakeholder reviewers; Board of Governors deliberations; and post-award negotiations and monitoring. This form is mandatory and must be signed and submitted to PCORI. Otherwise, the organization will not receive the contract. Consultant—An individual hired to provide professional advice or services for a fee. Contract—The legally binding document that PCORI uses to make awards for RRCS-IPD MA projects. Employer Identification Number (EIN)—The Federal Tax Identification Number used to identify a business entity. You may apply for an EIN in various ways, including online (see irs.gov/businesses/small/article/0,,id=102767,00.html). International applicants are not required to enter an EIN in the electronic Letter of Intent (LOI) or application; they should enter “999-99-999” in to the EIN field. Fringe Benefits—A form of pay for performing services. Fringe benefits commonly include health insurance, group-term life coverage, and non-wage forms of compensation. Indirect Costs—Costs not directly accountable to the project. Indirect costs include taxes, administration, personnel, and security costs. Institutional Review Board (IRB)—A group that follows federal regulations, state laws, and institutional policy to review, monitor, and approve research to protect the ethical rights and privacy of the subjects involved. Patients—Individuals who have or have had the condition under study. It may include patient surrogates or caregivers as well. It does not necessarily mean, but does not exclude, patient advocates or patient navigators. Patient-Centered Outcomes Research (PCOR)—Research that helps people and their caregivers communicate and make informed healthcare decisions while allowing their voices to be heard in assessing the value of healthcare options. This research answers patient-centered questions. A full definition can be found at /research-results/patient-centered-outcomes-research. PCORI RRCS-IPD MA Online Application System—PCORI’s online application and management system, designed to facilitate the applicant’s submission of materials in support of a conference award for IPD MAs. The PCORI RRCS-IPD MA Online Application System can be found on PCORI Online. Project Lead —The primary person on a contract or application for funding. He or she is PCORI’s primary point of contact for the contract or application. Professional Profile—A profile of the experience and accomplishments of a person who will play a significant role on a PCORI-funded project (see Biosketch). Public Project Summary—A summary of the project plan written for a lay audience. This summary is made publicly available if the project is funded. Reasonable Costs—A cost may be considered reasonable if the nature of the goods or services acquired or applied is appropriate and justifiable. The amount involved reflects the action that a prudent person would have taken under the circumstances prevailing at the time the decision to incur the cost was made. Senior/Key Personnel—Individuals who contribute to the project’s development or execution in a substantive and measurable way. The contribution is independent of financial compensation. Stakeholders—Includes clinicians (e.g., physicians, nurses, pharmacists, counselors, and other providers of care and support services); patient advocacy groups; community groups; researchers; health-related associations; policy makers; and organizational providers, purchasers, payers, and industries for whom the project results will be relevant. Typically, IRB fees are included in an organization's indirect cost pool. However, PCORI will allow this expense as a direct cost if the costs are not included as part of the indirect cost rate. By submitting the application, the PI and AO certify that their institution treats IRB fees as direct costs, and the fee is allocable to the study. IRB fees are subject to audit. PCORI will review all proposed costs. PCORI must deem costs to be allowable, allocable, and directly necessary for the successful execution of the proposed research project. A notification of pending award is subject to budgetary review and successful contract negotiation. The actual award amount may vary. For more information, please see PCORI Cost Considerations. PCORI considers computers, tablets, docking stations, mobile data and protection plans, laboratory and office furnishings, and software to be general office supplies that are not allowable as direct-cost charges.